Growing up, I used to hear the words wash day and I’d instantly think of washing the clothes. Now that I’m adult, it has taken on a whole new meaning. Wash day is what it’s called. But it actually wash day day, condition day, detangle day, and style day. It’s enough to make your mind tired and your arms tired, but the end result can be amazing. Kind of like that feeling we get when parenting goes right. I love my hair. I do not love doing my hair. However, I do understand that an important part of having hair that I love is taking care of it so I can continue to love it. For many women, the plight of hair is one that has great and beautiful rewards, but the journey is not always fun. Natural hair girls tend to love sharing hair advice, tips, and information, so I decided to share my hair process here. Not as a hair expert, but as a naturally curly girl who recognizes the need to talk about hair. 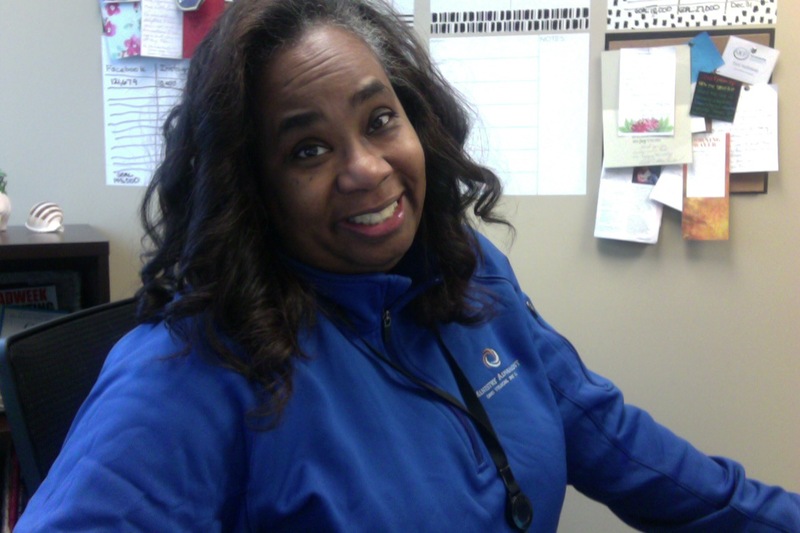 A hair care regimen – just like a skin care regimen- is something everyone needs. It’s a carefully followed process for taking care of something. When I have a hair care regimen and I follow it, my hair grows faster, I understand my hair type better, and I know where my pitfalls are and how to combat them. For me, the struggle with shrinkage and split ends is real. 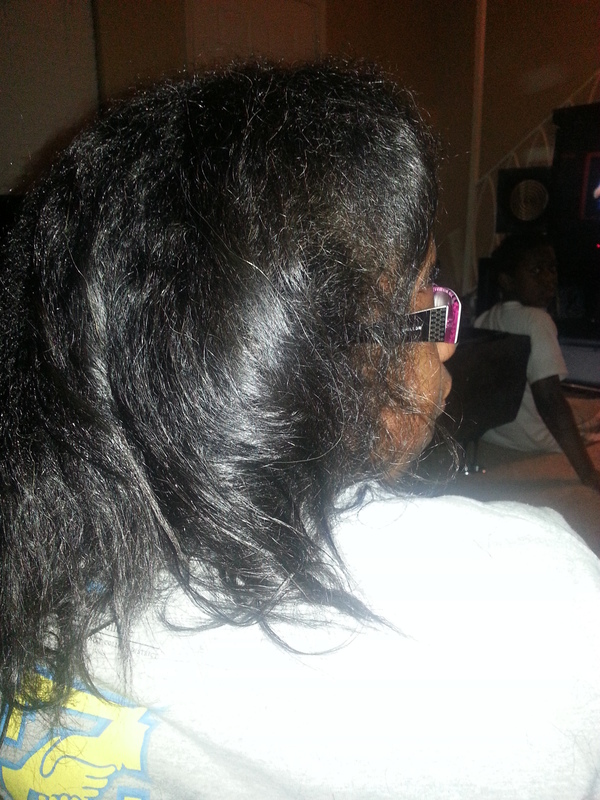 The struggle is real for me when it comes to shrinkage and split ends. Note: This post contains affiliate links. At the request of a friend, I actually tracked my hair care regimen over the course of the week. If you follow me on Snapchat, then you may know the downside to my tracking week, because by Thursday I was tired and all I wanted to do was put my hair in a ponytail. Which, I almost did, but then remembered I had an event to attend Saturday so not only did I have to continue to study my hair, I needed to stretch the style. This week, I took mother/daughter bonding to a whole new level. I need you to indulge me here for a few moments and stay with me. Do you remember how you learned about beauty and hair? Magazines and girlfriends, right? And now, our kids have YouTube in addition to those things…but ummm, what if they need to practice? 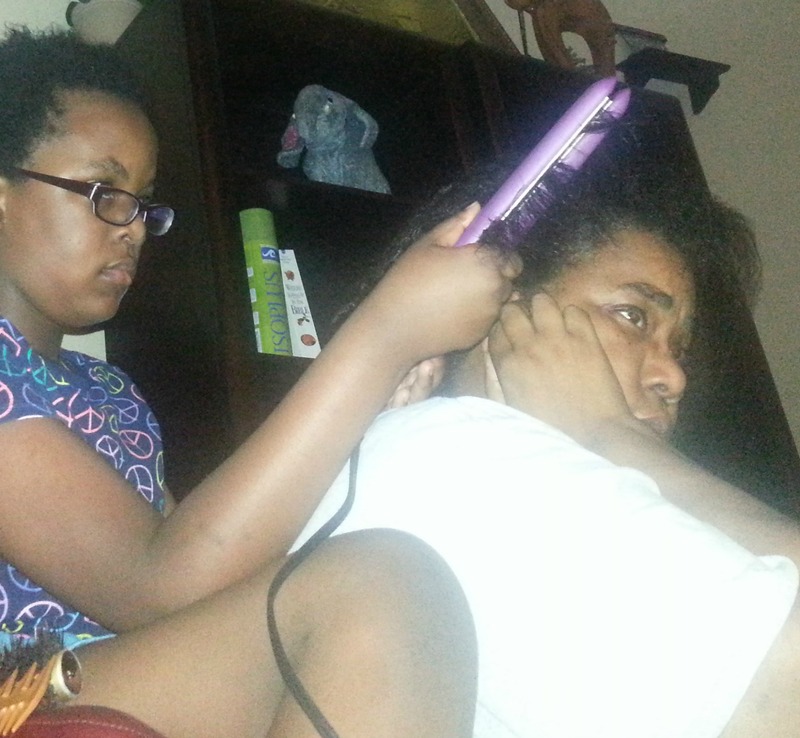 My daughters are at the age where they are learning how to properly care for hair. And since we are all naturalistas, we are trying a lot of different products and regimes to learn. We share all kinds of hair ideas, apps, and advice. But what’s a mom like me to do when T2 asked if she could actually do my hair? Let’s pause. She’s 10 years old. I love the way she brushes my hair, but she didn’t want to just brush it. 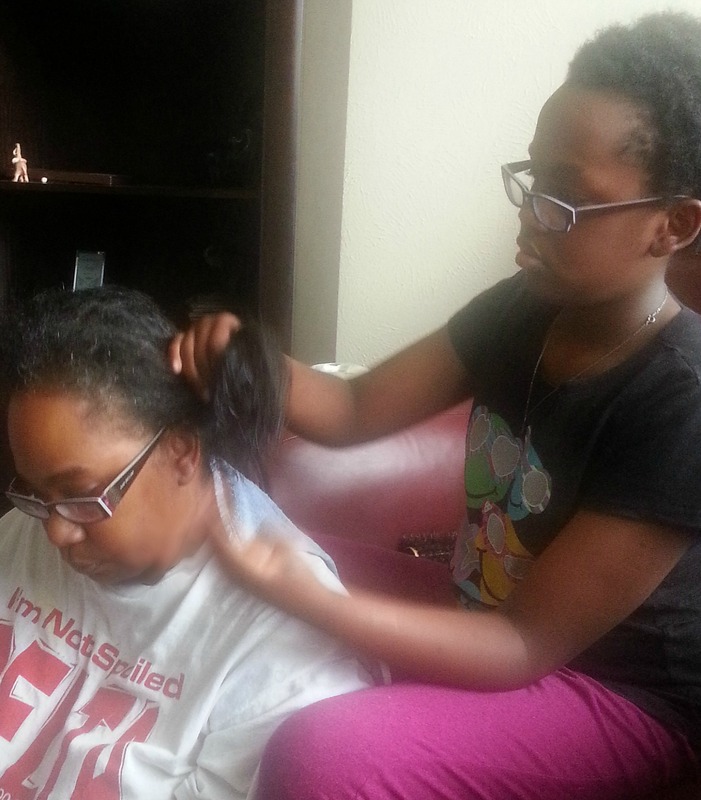 Her exact words were, “can I flatiron your hair?” I had to breathe…was I really going to give that child a heat appliance and allow her to use it in my hair? I talked to friends. I put it out there on Facebook. Cheryl even thought we could distract her by having a hair product fun night at her house where we girls all washed hair and tried different products on each other. And it worked. For about 3 weeks. And she asked me again. And she looked really cute when she said it. I washed my hair and she braided it all over. I spent two days with it in the braids over the weekend and took it down. The curls were beautiful but I had a lot of shrinkage. That was week 1. 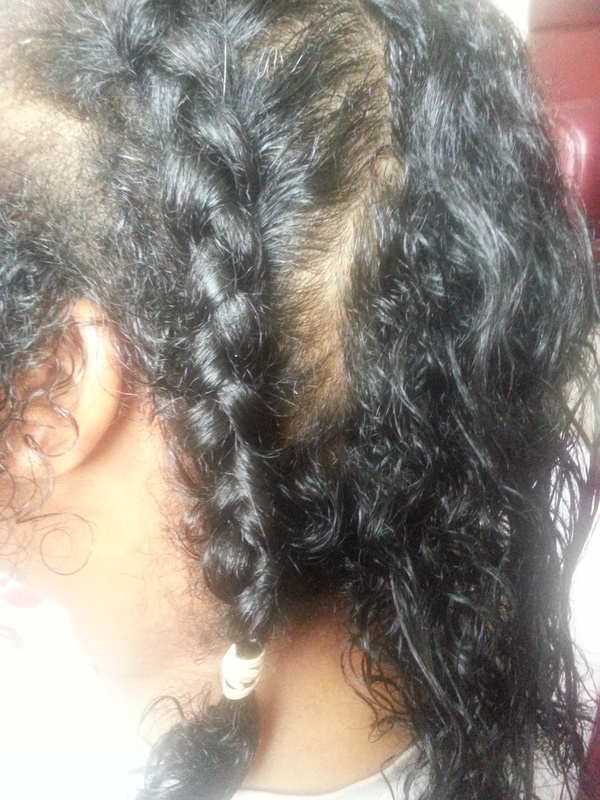 In week 2, she attempted to do a dry braid out. Here she brushed my hair and then braided it dry. She felt that she needed more braiding practice before we told anyone about the style. Lol. Which brought us to the day of the flatiron. She told her siblings that special move gave my hair more body. “It’s a special trick that only certain stylists know,” she said. So because it’s summer and there’s a thing called humidity, my hair was not straight very long. And she had to come up with a new style for hair-that’s-been-flatironed-but-doesn’t-look-like it. And she researched on YouTube some more. And she did it. And guess what? You get to see it tomorrow when I post a VLOG with the results!